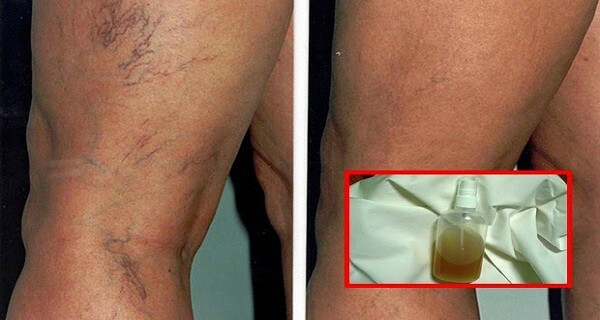 Successfully Treat Capillaries And Veins With These 4 Herbal Recipes.. Some of the most common problems among women are visible, cracked capillaries, visible veins or painful and swollen feet. These all are a sign that the blood vessels are weakened, mostly because of external factors, and partly because of internal ones. However, they also represent an aesthetic problem for each of us, since they are quite unpleasant occurrence. This is a problematic issue similar to cellulite, the causes are different in each woman, but the majority of us have it. The following simple advices can help you alleviate the problem.Standing, sitting and uncomfortable shoes with too high or low heels, pregnancy, will only accelerate the process of varicose veins. In addition, nutrition is also crucial, since the weakening of the vein wall can be prevented by consuming enough animal protein and plenty of vitamin C. You should also avoid sugar and trans fatty acids, since they can cause various body inflammations, which indirectly can weaken the capillary walls. In a narrow and high bowl, put the lanolin and gradually add the extract and the tincture, by half a teaspoon of each and stir them with a spoon until you get a homogeneous mixture. The mixing will be going slowly, so be patient. Now, melt the wax at a very low temperature, and then add it to the mixture, heat it all and stir it until you get a homogeneous mixture. When ready, pour the ointment into a suitable container, wait for it to cool and then close the container. Apply the ointment in a thin layer and gently massage the affected area with movements in the direction of the heart. Use it once a day and keep it at room temperature. Pour all the ingredients into a spray bottle and shake it well. First, peel and chop the chestnuts and put them in a jar. Pour the brandy over them. Seal the jar and leave it in a warm (but not too warm) place for 3 weeks. Stir the mixture occasionally. Strain the mixture through gauze after three weeks and store the prepared remedy in a dark bottle. This remedy is made for external use in combination with marigold ointment. First chop the chestnuts using tongs or a meat mallet. Then, put them in a jar and pour the brandy over them. Seal the jar and leave it in a warm place for 6 weeks. Stir it occasionally. After six weeks, strain the mixture and pour the medicine into a dark bottle. This extract can be consumed in a form of drops, in tea or water. It is advisable to drink it after a meal, since it can irritate the stomach wall. Note: In case you have a sensitive stomach, you should not drink such extracts.